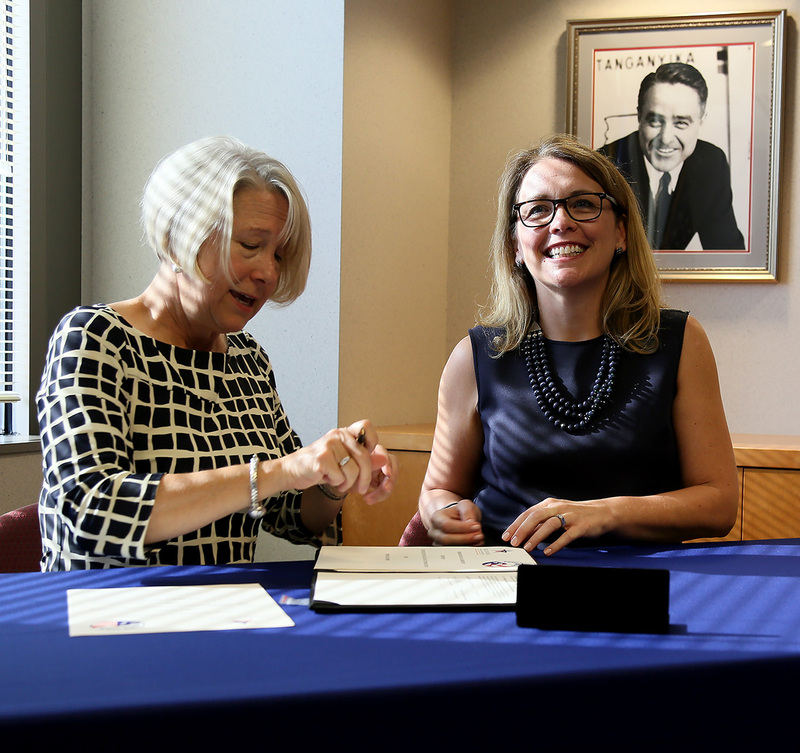 Peace Corps Director Carrie Hessler-Radelet, left, and MCC Chief Executive Officer Dana J. Hyde sign an MOA that aims to boost the impact both agencies have on the communities they serve around the world by bringing together MCC’s model of country-led, results-oriented development and Peace Corps’ grassroots, community-focused reach. WASHINGTON, D.C. – Millennium Challenge Corporation CEO Dana J. Hyde and Peace Corps Director Carrie Hessler-Radelet this week signed a memorandum of agreement (MOA) to renew and expand upon five years of successful collaboration between the two development agencies. The MOA aims to boost the impact both agencies have on the communities they serve around the world by bringing together MCC’s model of country-led, results-oriented development and Peace Corps’ grassroots, community-focused reach. The new MOA allows Peace Corps volunteers to support MCC fieldwork and lays the foundation to amplify the agencies’ progress and priorities more effectively to Congress and the U.S. public. Peace Corps volunteers may be assigned to work on activities and programs as part of the implementation of MCC compacts in countries of mutual interest, and the agencies will explore opportunities to collaborate on volunteer and staff recruitment activities. By joining forces once again, MCC and Peace Corps will continue to strengthen the effectiveness and sustainability of their programs by increasing information sharing between agencies. The first inter-agency MOA between MCC and Peace Corps was signed in 2010, and since that time, MCC has remained a meaningful supporter of Peace Corps’ mission. More than 30 Peace Corps volunteers in 15 countries have worked with MCC partners in the field, and MCC remains committed to hiring returned Peace Corps volunteers once they complete their service. 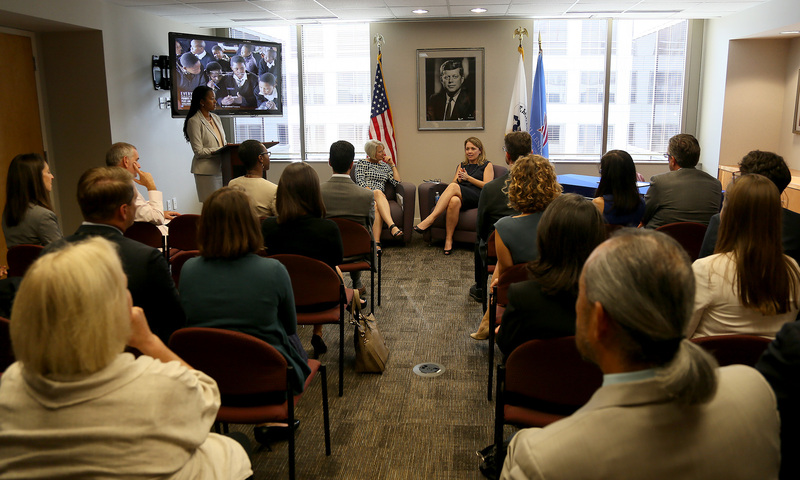 Peace Corps Director Carrie Hessler-Radelet and MCC Chief Executive Officer Dana J. Hyde address attendees at a meeting to sign a new MOA between the two agencies that will renew and expand upon five years of successful collaboration. MCC and Peace Corps’ collaboration was key to U.S. relief efforts in the Philippines following Typhoon Haiyan in 2013. One former volunteer, M. Thomas Duggan, returned to the Philippines as a Peace Corps Response volunteer and drew on the language skills and local knowledge he developed during his initial Peace Corps service to inform MCC’s work in repairing damaged infrastructure. This type of knowledge sharing will allow both agencies to make an even bigger difference in the communities they serve.